RefriApp invites you to visit our stand Hall 8 / 8-409 at CHILLVENTA, Nuremberg, Germany, from October 16th to 18th 2018. RefriApp invite you to visit us at CHILLVENTA 2016 at Nuremberg next October 11th -13th. At our stand you could find all information about our product besides an insteresting NEW that will be revealed during exhibition. Date: October 11, 12 and 13, 2016. RefriApp launched its corporate brochure which will be used to illustrate the different facets of this young company that manufactures and distributes special applications for maintenance of HVAC and Refrigeration installations worldwide. The brochure showcases corporate philosophy and its commitment with innovation, technological development and international expansion, in addition to a detailed review of its different technological solutions (cleaning, diagnosis and analysis and treatment of refrigerant leaks) and engineering services offered to HVAC/R sector. With a clean and smart visual format and in just 28 pages, any professional interested in the company can get an initial overview of what does and what offers. The corporate brochure will be available in both print and digital format and can be downloaded on the official RefriApp website. RefriApp is an engineering specialised in the maintenance of HVAC and Refrigeration systems. Our main goal is to lead refrigeration engineers to a more professional environment with appropriate technologies. There are technological advances in any trade sector. We try to gather the best novelties for the refrigeration systems services worldwide. 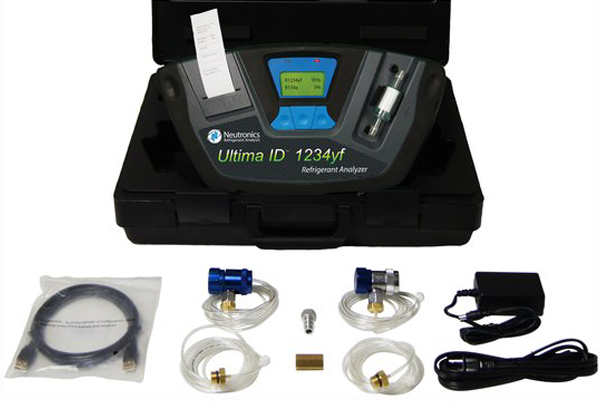 Thanks to the agreement between Unicorn Tools and RefriApp, our company has recently become Neutronics official distributor in order to offer this equipment for analysis and identification of refrigerant gases. Neutronics Refrigerant Analysis designs and manufactures advanced refrigerant analysis instruments for automotive and HVAC/R professionals around the globe. The state-of-the-art refrigerant identifiers and A/C sealant detection kits are used to prevent refrigerant contamination and avoid damage to costly A/C service and handling equipment. In hort, it is a family of portable, compact, easy-to-use and very accurate equipment capable of detecting, among others, R22, R134A, R404A, R407C, R410A, hydrocarbons, air and many different blends. In this way, RefriApp continues its commitment to provide the best technological solutions for the maintenance of HVAC and Refrigeration systems. Besides the Neutronics technology, mentioned above, the Spanish engineering company provides special applications for cleaning and recycling of R&CA circuits, Fri3Oil System; for monitoring and analysing the performance of the installations, Metreco and ClimaCheck; for detection, localization and controlling of refrigerant leaks, Ultraprobe 100kt1 and Lecosystem; or for cleaning and disinfection of ventilation ducts, with leading LIFA Air equipment . Check out more info of the Neutronics technology: http://refriapp.es/en/products/refrigerant-identifiers/.